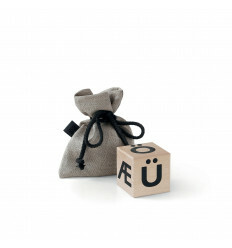 If you speak German, Norwegian, Danish or Swedish, then this block is a must-have! This wooden block is properly old-school. It is made of solid wood and not treated with anything. Its colour can vary a bit along with the natural colour variation of solid wood. The block is made of solid wood without any treatment. You can remove general grime by wiping the block with a damp cloth. However, if the block gets dunked in watercolour or meat stew, those stains will be difficult to remove.